MAGOFON is very effective for immediate pain relief with arthritis, gout, injuries, sinusitis, etc. Striving to improve the effectiveness and safety of physiotherapy treatments has led to the creation of “MAGOFON-01” embodying all the best that they can provide for human health pulsed Magnetic Field and Vibroacoustic Therapy. 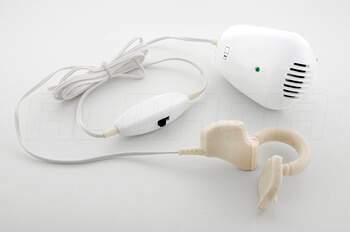 Experimental and clinical tests of “MAGOFON” device have confirmed that the combined effect of low-frequency alternating magnetic field and vibroacoustic oscillations of the “white noise” provides a stable therapeutic effect from the first minutes of exposure. From the first count: visible stable positive dynamics to improve function of joints or the spine (depending on the area of impact). Achieved by improving the function indicated 68% of patients, and the dynamics there are no complaints to the procedures for the 10th day was 100%. Contraindications are common to all physiotherapy equipment. The presence of small metal inclusions, as well as crowns in the mouth is not a contraindication to the destination MAGOFON device in therapeutic doses. improving the contractile ability of microvessels. This leads to the removal of emotional stress, improving sleep, to improve the sustainability of the brain to hypoxia for analgesic effect, to improve metabolism, to increase the activity of all departments of the endocrine system. Decreases the susceptibility of the organism to stressful situations and environmental factors. he combination of medication, gives a good result. The special training of staff is not required. For the treatment by “MAGOFON” is enough to make the working surface to a specified area in the instructions and carry out impact. That is probably widely used device in the home by both adults and children. 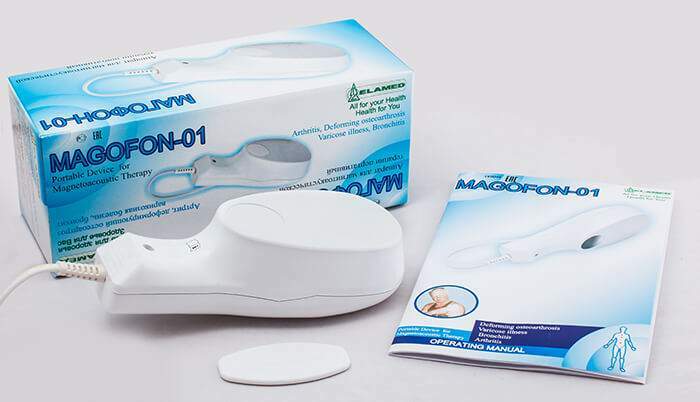 MAGOFON-01 device is a worthy successor to the unit of MAG-30 and is designed to provide rapid assistance in the treatment of acute illness, exacerbation of chronic process and prevention. Its therapeutic effect is based on a combination of time-tested magnetic field magician and unique vibroacoustic impact “white noise” that has no analogues among existing vehicles, which are comparable with the noise of the sea, as both generate sounds ranging from 20 to 20,000 Hz. The combination of these two physical factors meet the requirements, physiotherapy equipment presented to class at the present stage of development of medicine and puts MAGOFON-01 to a higher level compared with the existing equipment, as even among the complex of stationary vehicles and there is no close analogues. More potent therapeutic effect MAGOFON-01 in comparison to devices for treating only a varying magnetic field recorded protocols of medical tests of the same clinics where testing MAG-30 device and confirmed by modern diagnostic and control equipment, which not only assesses the changes in bodies, but also overall health. This allowed us to develop unique methods of application for the successful treatment of many diseases. 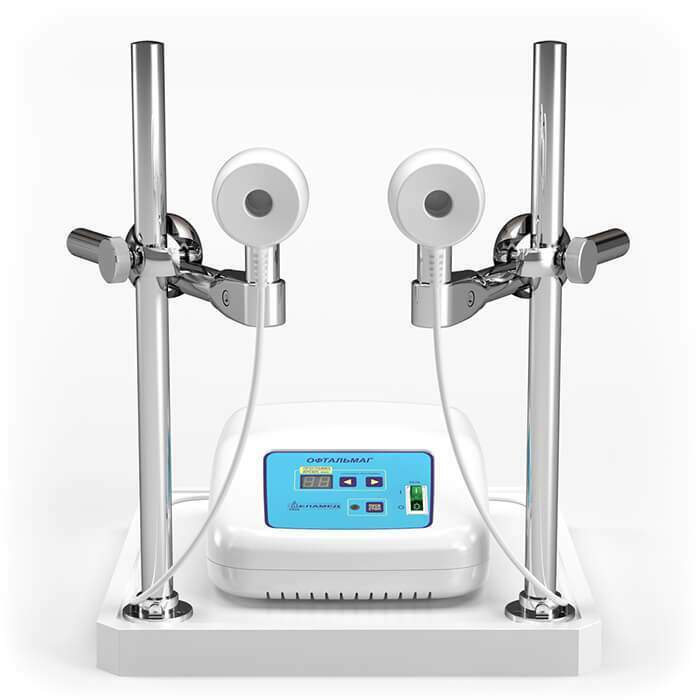 The advantage of concurrent physical factors device MAGOFON-01 before the magnetic field or vibroacoustic impact, accepting separately from each other, lies in the fact that these two factors under the joint impact of the increasing effect of each other, significantly increasing the therapeutic effect. The result is activation of the body’s defenses against external influences, which leads to a rapid cessation of acute illness or exacerbation of a chronic process, and also to reduce the risk of other diseases. This effect is associated with the overall restructuring of the body and a favorable response to all organs and systems, as noted by many patients, sensing a significant improvement in general condition after treatment by MAGOFON. In addition, the use of MAGOFON enhances the action of drugs and ointments, creams, gels, tinctures, which are widely used not only in treating but also in Cosmetology. Under the influence of MAGOFON not only increases the elasticity of the skin, causing it to rejuvenate, but also reduces wrinkles in some areas completely go away; there is an accelerated regeneration of damaged tissues, etc. One of the many proofs of a practical application for assistance in treating such serious diseases as obstructive bronchitis in children, where with help of staff and a minimum of medicines in the short term shot shortness of breath and breathing restored, without the risk of side effects of drugs and psychological trauma related with injections. Magofon 01 is 510(K) listed with the FDA as a therapeutic massage. As such, it is already considered safe and effective for pain relief, promoting local circulation and muscle relaxation. Long-term clinical trials in leading clinics of Russia, Europe, China, India, Israel and Australia show excellent results. Side effects were not identified. MAGOFON-01 made in Russia expressly for use just in Power Grid of USA/Canada (120 V/60 Hertz). 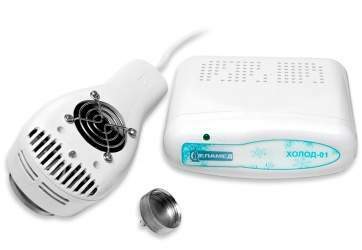 MAGOFON -pulsed Magnetic Field and Vibroacoustic Therapy, is very effective for immediate pain relief with arthritis, gout, injuries, sinusitis, etc.